This is made every year for a local Irish festival. 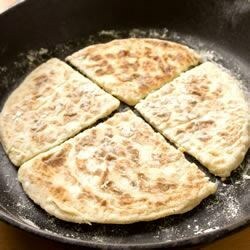 Simple and easy, it's traditionally served as part as the Traditional Ulster Fry with bacon, eggs, sausages, etc., but is great warmed and sprinkled with salt or smothered in butter, cheese, or jam. It's also great with savoury stews. Please note the above ingredients are approximate. Potato Bread is best made while potatoes are still hot. Peel and boil potatoes until tender. While hot, mash potatoes well with salt and butter. Gradually work in flour in smaller increments until a soft dough forms. Dough should be a little tacky but workable. Turn out onto floured surface and knead for about 1 minute. Divide and roll into a circular shape about 9" and 1/4" thick. Cut into 6 or 8 'farls' (wedges). Grill in a hot, greased griddle or pan until well browned on both sides.